On a blustery late-December afternoon, sixty students sit watching a video case presentation in a darkened Aldrich Hall classroom. Participants in a special HBS orientation program for new international students,* they hail from thirty different countries, among them Argentina, Russia, Sweden, and Turkey. When the video ends, Janice McCormick, director of Academic Services, flicks on the lights and leads the group on its first foray into case method learning. Despite McCormick's encouragement, it is an awkward exercise, marked by nervous glances around the room and tentative verbal exchanges. At the conclusion of the session, McCormick inquires, "So, how did this case method discussion feel to you?" "There are so many ideas and not enough opportunities to discuss or express them," says another. "There isn't one lesson or right answer, so you wind up feeling like, 'So what?'" someone else comments. * Note: The term "international" in this article refers to individuals who were born outside the United States and are not permanent U.S. residents. According to HBS officials, only those who match this definition are counted by the international student statistics. The international students who grappled with this introduction to an essential aspect of life at HBS are part of a long tradition. Business students have traveled to Soldiers Field from the far corners of the world since the School's founding in 1908. According to Jill H. Fadule, managing director of MBA Admissions, two international students - one from France and one from China - were among the School's inaugural class of approximately 25. Since that time, thousands of international students have participated in the School's MBA and Executive Education Programs, bringing their valuable global perspective to classroom discussions. While welcoming students from other countries to its classrooms over the years, HBS has engaged in numerous other international outreach activities. 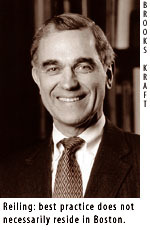 Faculty and administrators have helped to launch business schools in other countries and conducted pathbreaking international research and case development projects, encouraged in the last few decades by the leadership of the late Dean Lawrence E. Fouraker and former Dean John H. McArthur. As the 20th-century world has evolved into today's "global village," the Business School's commitment to international business education has expanded. When Dean Kim B. Clark announced plans last fall for the opening of an HBS research facility in Hong Kong, he underscored the importance of the School's Global Initiative as HBS enters a new century. "We are wholeheartedly committed to the idea of developing new understanding, deeper knowledge, and intellectual capital about business around the world," he stated. Along with increased support for global research, another visible manifestation of that commitment has been the recent growth in the number of international students in the MBA Program. 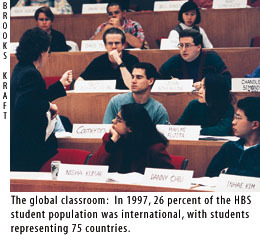 In 1988, 16 percent of the HBS student population was international, a figure that had grown to 26 percent by 1997. "This year, by country count, we have the most diverse class in the School's history," Fadule observes, noting that 75 countries are represented in the Classes of 1998 and 1999 combined. "We have students from as far away as Georgia, Brunei, Gabon, and the Ivory Coast," she says. From Argentina to New Zealand, few corners of the world are missing from today's class profile. Professor Steven C. Wheelwright, senior associate dean and MBA Program chair, considers the contributions of international students essential if the MBA Program is to achieve its mission of developing outstanding business leaders who contribute to the well-being of society. "International students bring an important perspective to the classroom that strengthens the value of the HBS learning model for all our students," he notes. Other faculty members agree that diverse classes form the cornerstone of excellent courses. "Diversity of all kinds is the basis upon which dynamic case discussions are built," notes Professor Malcolm S. Salter, who heads the MBA elective curriculum and teaches Coordination, Control, and the Management of Organizations. Salter believes that "all great courses at HBS communicate performance hypotheses - notions about what makes for good business practice - for students to examine, challenge, adopt, adapt, or even reject." To avoid generating only "a grossly ethnocentric set of values," continues Salter, explorations of performance hypotheses require a diverse student body. "We also need to be alert to the fact that different cultures place different expectations on business," he adds. "These expectations, too, need to be examined and debated. Having international students in class helps to keep these issues front and center. This is why, to varying degrees, HBS has sought an internationally diverse student body for decades." Professor Henry B. Reiling teaches finance courses, such as Tax Factors in Business Decisions, as well as the MBA Ethics module. He is faculty chair for the members of the Class of '99 who entered the MBA Program in September 1997. Reiling sees the presence of international students at HBS as a basic necessity in today's global economy. The United States, Reiling notes, no longer holds the "monopoly position" in the world marketplace it once enjoyed. "Students come here to learn, but they also have a responsibility to teach," he observes. "They have been admitted to HBS on the basis of their unique experiences - some of which reflect different political, economic, and religious cultures - with the expectation that they will share their perspectives in the classroom." As students mull over cases in class and present their ideas for potential solutions, says Reiling, they and the faculty often find that "there may be three equally good approaches" to a business problem. "The best practice does not, and increasingly will not, necessarily reside in Boston or even in the United States." Beyond the classroom, international students are a vital presence in the daily activities of the student body. Wheelwright points to the existence of nine international student clubs at HBS, in which two-thirds of the student body are members. Their activities, which are open to the entire HBS community, range from running conferences to leading study trips abroad and from organizing major social events to sponsoring significant recruiting activities. "Their perspective and energy greatly enrich the entire HBS community," he notes. International students hail from homelands that may differ vastly from each other, but once they arrive at the School, they tend to face common challenges. This is particularly true when English is not their first language and in instances where their home culture differs greatly from that of the United States. In her orientation discussions with newly arrived international students, Maureen Walker, associate director of Academic Services, invites them to talk openly about any questions or concerns they may have. Year after year, she reports, topics raised during orientation weigh in heavily on language, class participation, and acculturation challenges. No wonder. In the Business School's case-based curriculum, where 50 percent of the grade is based on class participation, students sink or swim by virtue of their ability and willingness to speak up in class. Walker points out that many international students come from cultures in which it is taboo to debate with a professor or a fellow classmate. Other societal norms dictate that greater respect accrues to the student who speaks less, or that "you don't open your mouth unless you're absolutely sure of what you're talking about," she explains. Patricia K. Light, director of MBA Program Support Services, notes that in the United Kingdom and European cultures, "class participation is not an integral part of the educational process." Cultural differences may affect interactions between teachers and students outside the classroom as well. "There are often vast differences among cultures regarding whether or not you should go to talk with your professor. In some cultures," Light explains, "you don't do that because it's seen as trying to influence the instructor." Skills related to reading, writing, listening, and speaking at HBS are just as important as becoming proficient in English, says Light. She also believes that issues of adaptation involve the whole person. "It's too easy to say that students need only adapt to the language," she states. "They must also develop a working knowledge of what our educational environment is about and what the norms and expectations are." Intensive coaching sessions, such as those offered through International Orientation Day's case discussions, are intended as a response to and an anticipation of international students' needs as they enter HBS. The School offers a comprehensive array of services for internationals, from help with class participation and exam preparation skills, to support and advisory services related to adjustment problems and confidence issues. Depending on the student, such services may be offered months prior to the orientation program. Maureen Walker reports that "some students are identified in the admissions process as people who would benefit from prematriculation skills building." These may be individuals whose homeland economy is not based on Western economic principles or who are not yet highly skilled in English. "We invite these students in early and provide them with an intensive language immersion and acculturation program," Walker explains. "During this period, they get to know the community and become familiar with resources that will be helpful to them going forward. They also start to build personal relationships with faculty and administrators who may be pivotal to their adaptation process during their two-year stay." The student government at HBS now includes international student representatives, as well. These representatives are in a good position to sound the alert about "policies or practices that may have the unintended consequence of marginalizing international students," Walker says. One example is the common tendency of some professors to call on the first student who raises his or her hand. Those who need more time to translate their thoughts into English are at a distinct disadvantage in this situation. Without such feedback mechanisms in place, say administrators such as Pat Light, the School would miss important clues. "Some years back," she relates, "we spoke with international students who said they found the environment here not as welcoming as it might be." When the issue was explored with the students, administrators discovered that many of these feelings of exclusion were prompted by the absence of foreign-language newspapers in the HBS library. "This is something that's easy to fix, of course," says Light, "but no one at HBS had thought about it before. We need student input to know how to help." HBS also offers services that attend to the needs of students' families. One important resource is a mentoring network, made up of more seasoned international students and their spouses. The network offers help on a range of issues, Walker says, from something as simple as how to buy groceries to something as serious as the emotional stresses of displacement and change in family life. "We also meet often with international students to stay abreast of their concerns and to learn new ways of being helpful," Walker notes. "We work with the total community, because we firmly believe that there are many important adaptation skills that students can learn here. We also believe," she adds, "that it's equally important for the broader HBS community to learn from international students and to embrace opportunities to make this an environment in which everyone's learning is enhanced." Fungai H. Ruwende (HBS '98), a student from Zimbabwe, feels that the process is working. "I've found that my classmates are very cooperative and supportive. It's competitive - the discussions are lively, and people often take opposing views - but it's all collegial." "I think it's an advantage to be an international student here," comments Luis J. Solana (HBS '99), who came to HBS from Mexico. International students, says Solana, "have a different perspective in many of the case discussions. This enables us to participate more by sharing real non-U.S. experiences while enriching community learning." Solana says he and other international students would like the curriculum to include an even more extensive base of cases on companies competing in the global arena. It is likely that the number of international cases in the MBA curriculum will indeed grow as the HBS Global Initiative (see sidebar) moves forward, thereby enabling the School to strengthen its research capabilities around the world. Another priority of the Initiative is to enhance internationally directed marketing efforts, which have been fairly modest to date. 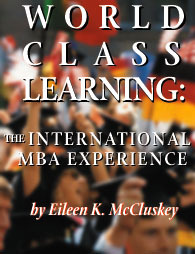 Historically, the School's MBA Program has relied on the strength of its far-reaching alumni network and worldwide reputation to attract non-U.S. students. "Our international outreach activities have been focused primarily in cities with an alumni presence," reports Martha B. Achenbaum, associate director of MBA Admissions. "For example, the HBS Club of Paris has been hosting an information reception for many years, and these sessions are very well-attended," she says. Achenbaum notes that outreach on the international scene "is a new activity for HBS. We've always done quite well relying on our alumni network. But that doesn't mean we can't do better or find more people with the leadership qualities we seek," she observes. One good reason for conducting more deliberate marketing activities is to attract students who might not otherwise consider applying. For some of those students, the largest barrier in considering HBS may be a financial one. Such was the case for both Solana of Mexico and Ruwende of Zimbabwe. "I think the biggest challenge was to get all the funds needed for my wife and me to come here to live and study," Solana reflects. Ruwende notes that for most Africans, "it is extremely difficult, given earning levels, inflation, interest rates, and currency devaluation" to save the amounts necessary to matriculate at HBS. "I think the sheer financial requirements deter many talented Africans from applying." The School has been working to address this problem. The Canadian Initiative, for example, launched by then Dean John McArthur in the early 1990s, was intended, in part, to raise money for tuition assistance to qualified Canadian students. The Initiative's first phase, which raised $20 million (Canadian), was completed last year. Because international students do not generally qualify for federal, institutional, or private loans, fellowships are a key resource. Many individual and class gifts to HBS have been earmarked for this purpose. The Class of 1970's 25th Reunion gift, for example, has already benefited 23 recipients, most from developing countries. With more than thirty thousand HBS MBAs now living and working outside the United States, it isn't difficult to find evidence of the value of HBS training in the international business arena. 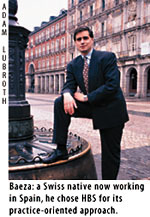 One such graduate, Peter Baeza (MBA '96), was recently promoted to director of National Accounts with L'Oreal in Spain. "Prior to my MBA studies," says Baeza, a Swiss native, "I had been working in Switzerland for Nivea for four years as a group product manager in the marketing field. I liked working in the consumer products industry and decided to continue in this field. I came to HBS because I wanted to get insights about American business practices and experience a practice-oriented approach during my MBA studies." Baeza approached his job search systematically, choosing L'Oreal for its innovative product development and leadership position in the cosmetics industry. "I researched different companies in Baker Library, called HBS alumni to find out about contacts, and finally wrote directly to L'Oreal," he recalls. "The HBS name certainly opened doors." Baeza is pleased with his career path. "My move to L'Oreal's sales department complements my marketing experience," he says. "I believe it is important to gain experience in complementary fields if you work in consumer products, rather than become an expert in one particular field. Obtaining experiences in different cultural environments also helps one to understand the increasingly global environment. "At HBS," Baeza continues, "I learned to establish priorities, work under pressure, look at projects with a Ôhelicopter view' before looking at details, and be aware that there is usually no set answer to a question or problem. These are things that I can directly implement at my current job. All in all, HBS was a tough but rewarding experience." Before matriculating at HBS, Slovakian student Monika Kubicova (MBA '96) chose to prepare by gaining work experience both in her home country and in the United States. Having made contact with an HBS graduate working for a U.S. government- funded venture-capital firm in Slovakia, Kubicova gained the necessary baseline work experience at home before joining McKinsey & Company in Prague and Cleveland. Kubicova now works in London as an associate with McKinsey in a general consulting role, assisting clients from a variety of industries with their strategic marketing plans. "I enjoy working with global teams," she reports. 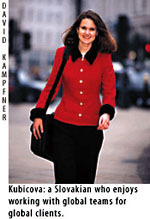 "On my current study I work with Americans, Germans, Irish, Poles, French, Dutch, and Austrians. We are designing a multiple market entry strategy for a global client and have to communicate often via video- and teleconferencing." Kubicova finds that her MBA skills come in handy every working day. "The case method is the best training for my job," she says. "I have to be able to quickly grasp a new set of issues with each client, and my HBS training prepared me to do that." Israel native Isaac Devash (MBA '93) decided to pursue an MBA degree after nine years of international work experience at Credit Suisse First Boston in New York, London, and Tokyo. After completing his MBA, Devash brought a global perspective and his HBS contacts back to Israel, where he now serves as managing director for The Israel International Fund. "This is a private equity fund that I founded with two major banks. We are dedicated to the globalization of technologically competitive Israeli companies," Devash explains. "The HBS network has been very helpful to us. Two of the deals the fund has invested in so far have been with HBS colleagues." Devash is actively involved with the HBS community in other ways as well. As president of the HBS Club of Israel, he has returned to Soldiers Field to speak with current students. Along with other members of the Israel club, he is also involved in encouraging selected colleagues to apply to HBS. "Mentoring new HBS applicants is an important way to encourage the next generation of international managers to pursue excellent general management training," says Devash. It is also one important way to ensure that the emphasis on international business practice that goes back to the School's founding will continue to contribute to the institution's distinctive character well into the 21st century. One of several major priorities targeted by Kim B. Clark shortly after his tenure as Dean began in 1995, the HBS Global Initiative touches on a broad spectrum of issues at the heart of the HBS tradition - from faculty research and teaching, to student recruitment, to ties with international alumni. Karen E. Wilson (MBA '91), executive director of the Global Initiative, notes that by"developing more globally focused research, cases, and courses, the School seeks to enrich the classroom experience in both the MBA and Executive Education Programs." David Yoffie, the Max and Doris Starr Professor of International Business Administration, is one of several senior faculty involved in implementing the Global Initiative. "The HBS campus in Boston is justifiably seen around the world as a mecca of business and management knowledge," he says. "However, given today's global economic structure, we must seek out the wisdom that is to be found in the world's other dynamic areas." Last year, the School opened its first off-campus research site, in California's Silicon Valley. The Global Initiative will be taking a big step forward this year with the launching of the first in a series of overseas research offices. The first such site, in Hong Kong, is due to open in about six months and will likely be followed by locations in Latin America and Europe in future years. The main function of the offices will be to facilitate and expand the faculty's research and course development efforts in distant locations. "At the present time, about 25 percent of HBS cases developed each year are non-U.S.-based," Wilson notes. "We plan to generate more of these materials in the future and build upon our international expertise." Having a presence in far-flung regions will bring HBS closer to realizing the Initiative's goal of making the School a more globally minded institution. 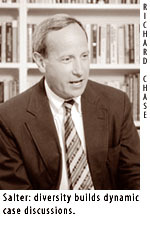 Professor Robert H. Hayes, faculty chair of the fledgling Hong Kong project, notes, "Over time, we expect that such offices will become real centers of our international activities, providing faster and better perspectives on emerging problems and issues than we would get at Soldiers Field and encouraging collaborative efforts with academics and business managers in other countries." Says Hayes, "It's going to ensure that HBS remains on the absolute cutting edge of management practice well into the next century."